We never seem far from an election these days, so it seemed a good opportunity to compare today’s elections with one that took place in Essex over 250 years ago in 1734. This month’s document (D/DU 3053/1) is a rare survival. It looks to be the original working draft of the poll of 1734 used by the Sheriff, Champion Bramfill, to record the votes cast by electors. The electors’ names are recorded along with where they lived and where they held property that qualified them to vote in Chelmsford, and the votes that they cast. The list does not appear to be in any order, suggesting that what we see is the order in which electors appeared in Chelmsford to vote. Their actual votes can be seen recorded in columns on the right. A page from the 1734 poll book (D/DU 3052/1). Electors seem to be recorded in the order they turned up to vote. Their name is recorded, along with where they lived, where they held land that qualified them to vote in Chelmsford, and the votes that they cast. There is not much about the 1734 election that we would recognise today as a free and democratic election. Only a small proportion of the population was entitled to vote; electors had to be male, and had to own property of a certain value. The Reform Acts of the nineteenth century gradually extended voting rights but it was not until 1928 that all men and women aged over 21 were entitled to vote. The secret ballot was not introduced until 1872, and the votes cast were published in a printed book (we have a copy catalogued as LIB/POL 1/5). The published version of the poll book, which showed who each elector voted for (LIB/POL 1/5). At the time, two “Knights of the Shire” as they were termed, represented Essex in Parliament (the Boroughs such as Maldon and Colchester also had their own representatives). Voters were entitled to cast two votes, and had three candidates to choose from; Lord Castlemain was a member of the Whig faction, while Thomas Bramston and Sir Robert Abdy were both Tories. Both seats were taken by the Tories (Castlemain received 2,146 votes, Abdy 3,378 and Bramston 3,056). This was contrary to the national trend, during the period known as the ‘Whig supremacy’ between 1715 and 1760. The terms ‘whig’ and ‘tory’ were originally terms of abuse coined during the Exclusion Bill Crisis of 1678-81 (‘whig’ comes from ‘wiggamore’, a Scots term meaning cattle-driver, and ‘tory’ from the Irish ‘torai’, meaning outlaw or robber). As Charles II’s reign drew to a close, the whigs were worried about his Catholic brother James II inheriting the throne. Catholicism was associated with the absolutist style of rule of the French Catholic monarchy, and whigs favoured a constitutional monarchy, with the monarch ruling in conjunction with parliament. Tories, on the other hand, thought that parliament had no business meddling with the line of succession. James II did inherit the throne on the death of Charles II in 1685, but he did not last long. He was pushed out of power in 1688 in the ‘Glorious Revolution’, and replaced with his daughter Mary II and her husband William of Orange (William was also her first cousin and James’s nephew). For the next few decades rebels known as Jacobites (from the Latin for James, Jacobus) attempted to restore James II and his heirs to the throne. Both tory candidates in Essex in the 1734 election were Jacobites, and had key roles in an uprising that was planned to take place in February 1744. James II’s grandson Charles (known as the Young Pretender or Bonnie Prince Charlie) was to lead an invasion supported by the French army, landing at Maldon. Thomas Bramston was slated to be one of the leaders of the uprising in Essex, and was described to the French government as a ‘gentilhomme d’un grand crédit dans la province d’Essex où les troupes doivent débarquer’ (a gentleman of great standing in the county of Essex where the troops will land). Sir Robert Abdy was one of six tory MPs who knew the military details of the scheme, and was referred to by the Pretender himself as one of his principal advisers in England. In the end the planned invasion did not materialise; a storm scattered the ships which would have carried the troops across the channel, and the government got wind of the conspiracy. Bonnie Prince Charlie landed in Scotland instead in 1745, a campaign that ended in brutal defeat at the Battle of Culloden. 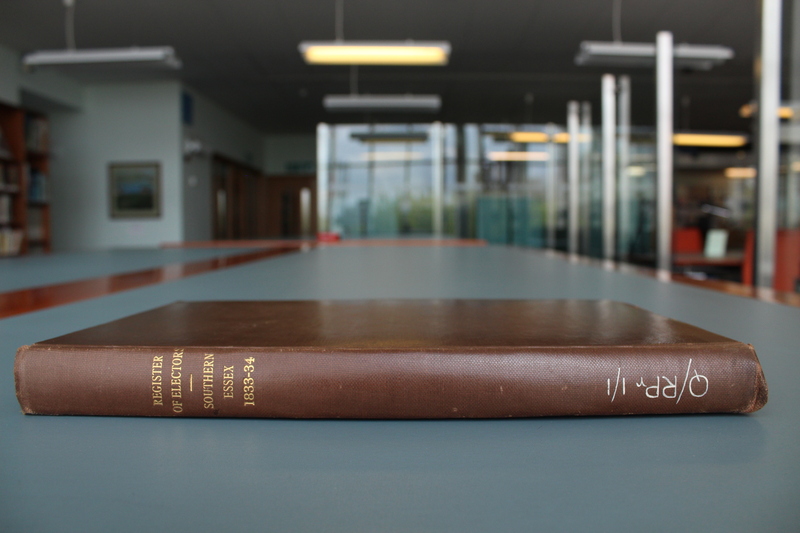 The poll book will be on display in the Searchroom throughout June 2017. The right to vote is something which we are all today well accustomed to, and perhaps even take for granted. In the 2010 General Election 847,090 people voted in Essex. Not all that long ago, many of these people would have been barred from the polling station. Turn the clock back 100 years and what we today recognise as a fair electorate would be halved straight away by the exclusion of women. Go back a little further and many men were excluded on the grounds of not owning enough property. Return to 1830, and only about 10% of the adult male population qualified to vote. Essex had a population of about 300,000 people at this time, only about 6,000 of whom could vote. Although not exactly a scientific comparison the pictures below give you some sense of just how much the electorate expanded during the 19th and early 20th centuries. This first, slender volume from 1833-34 is one of the earliest electoral registers held at the ERO. There were so few voters at this time that they are all listed in just two volumes this size, one for the northern part of the county and one for the south. By the time the super-sized registers for the Walthamstow Division pictures below were created in 1914 and 1915 most men had the vote, but women were still excluded. The population in metropolitan Essex had increased considerably in this time, but even taking this into account the difference in the size of the books and the changes this represent in voting qualifications are remarkable. Today Essex elects 18 MPs but in the 1700s and 1800s there were only four places in Essex where polling could take place for parliamentary elections – the Boroughs of Maldon, Harwich and Colchester, and the county town of Chelmsford – with each sending two MPs to Westminster. Elections themselves were conducted very differently too. The secret ballot was not introduced until 1872; before then, voting was done openly, by a show of hands or voices, and with lists published of who had voted for whom. Thus a vote was not exactly a free one; at a time when your landlord, boss and local magistrate might all be the same person, who would be brave enough to vote against the candidate he had put up? A further Act in 1883 (the Corrupt and Illegal Practices Prevention Act) criminalised attempts to bribe voters. Before the reforms of the 19th and early 20th centuries parliamentary seats in Essex were monopolised by leading county families such as the Bramstons of Skreens, the Luthers of Brizes, the Conyers of Copped Hall, the Maynards of Easton Lodge, the Harveys of Rolls Park, the Houblons of Hallingbury Place and the Bullocks of Faulkbourne Hall. Often there was only one candidate standing; between 1734 and 1832, only 8 elections in Chelmsford were actually contested. The ERO looks after hundreds of electoral registers dating back to the 1830s. As well as telling us something about the expansion of the electorate, they can also be useful in tracing people and their historic addresses. 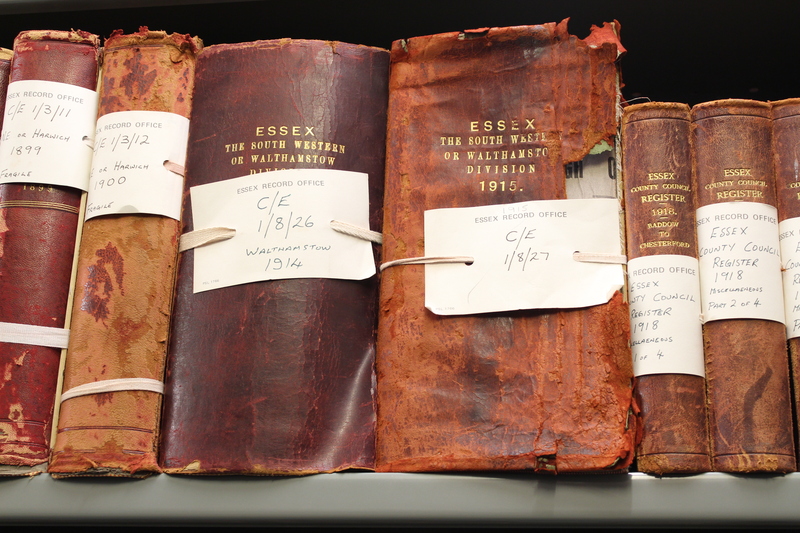 The registers for 1918 and 1929 have been digitised and can be viewed on Seax as they were the first years in which women could vote (married women over 30 in 1918 and all women over 21 in 1929). We are planning to continue to digitise our historic electoral registers and make them available online. The UK has only had universal suffrage and equal voting rights for men and women since 1928 – just 87 years ago – something that is worth bearing in mind as we prepare to make our way to the polling stations on 7th May. Following our recent post on how the Essex County Chronicle reported on local responses to the outbreak of the First World War, today we take a look at a few of the stories published the following week on 14 August 1914. These snippets from the Chronicle give us a bit of an insight into the sorts of things that people were talking about and doing as the world slid into chaos around them. Recruiting for Kitchener’s New Army had already begun, and it was reported that large numbers of Essex Territorials had already volunteered for it. A report on mobilisation read by the Secretary stated that the force had started to receive call ups for various sections on 30th and 31st July and that ‘in the county of Essex they had been as prompt as any other county in England. All the Territorial Battalions were now mobilised’. They had been 1100 under strength, but all vacancies had been filled. A young man visiting Harwich meanwhile had filled some time by sketching on the pier: ‘He was promptly arrested by the military sentries on duty, and taken to the Redoubt. After detention for two hours he was released’. His story was presented as a warning to others. Some Essex residents had been in Europe when the war broke out, and some ran into trouble before they managed to make it home. The Bishop of Colchester had been on holiday, and was arrested in France as a spy for snapping a photograph. 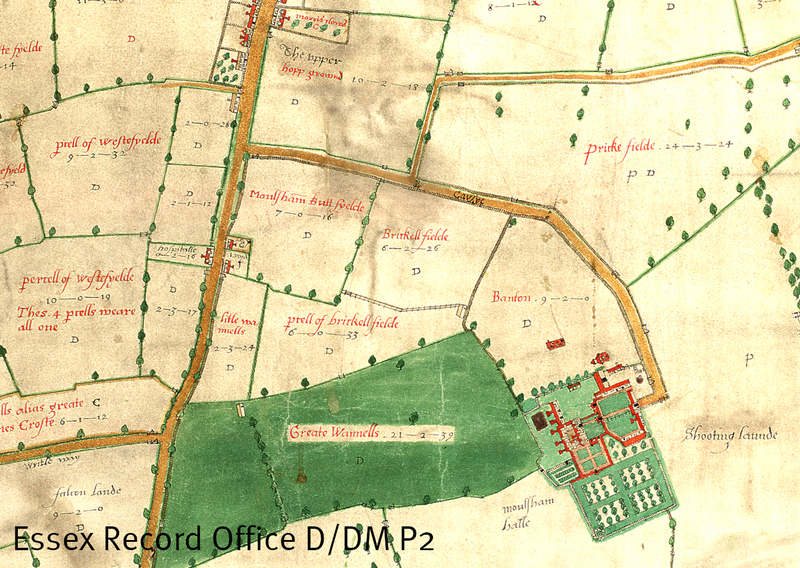 The Chronicle reported that he was ‘pounced upon by the military and taken to a guardroom’, but after explaining managed to make it safely back to Colchester. 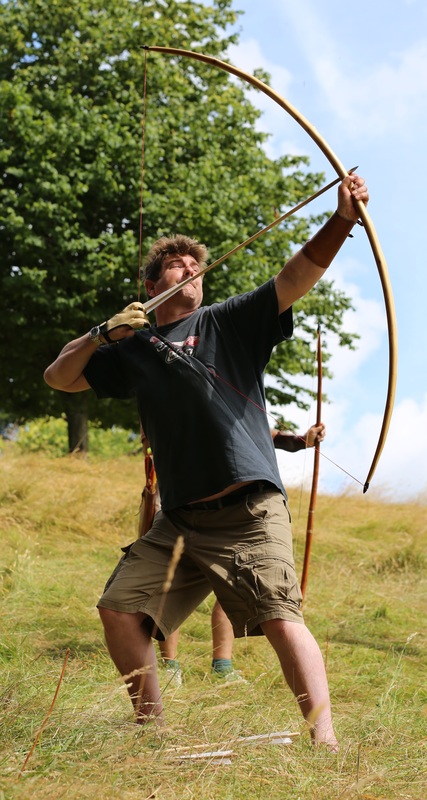 People had already begun to mobilise to prepare to defend their county. 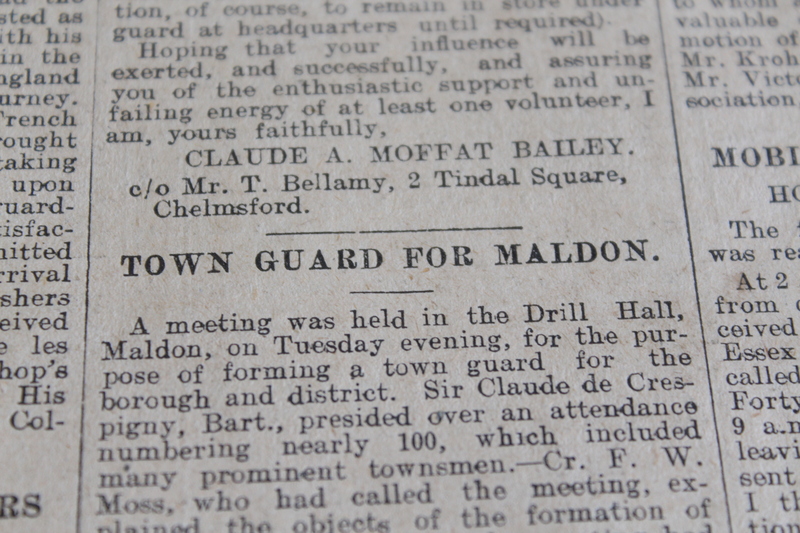 In Maldon, for example, a meeting had been held at the Drill Hall to form a town guard for the borough and district. The guard was for men too old to join the Territorials who wanted to play a part in defending their homes. Nearly 100 people were reported to have attended, and apparently a large number of men enrolled and began to drill almost immediately. Across the county, local leaders had received telegrams from the Prince of Wales asking them to assist in the setting up of local branches of the National Relief Fund. 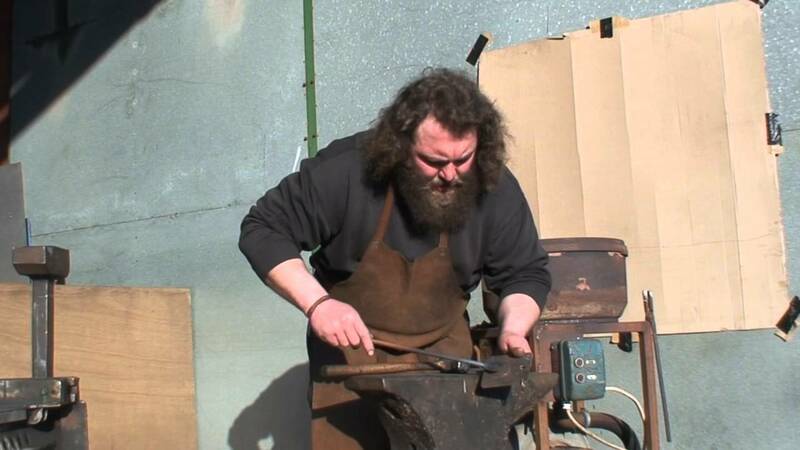 Local employment already being affected; the Mildmay Ironworks had had orders for piano frames cancelled, and the oyster trade was likely to have a bad winter. The council agreed to ask the Surveyor what useful and necessary works the Council could do to provide employment, and Mr Booth also proposed formation of a Relief Committee. Local people quickly began to prepare to aid the expected numbers of wounded. 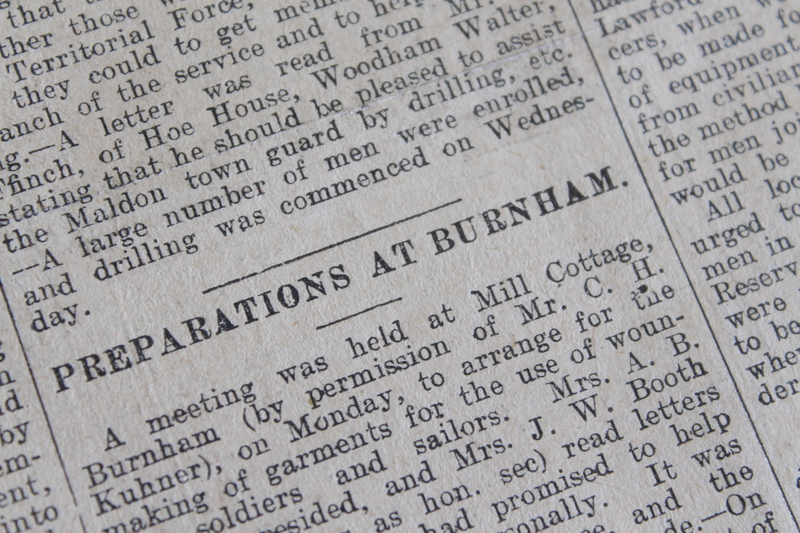 In Burnham, a meeting was held at Mill Cottage to make arrange making clothes for wounded servicemen. The group who met had already received offers of help, both financial and personal. A series of first-aid lectures had also begun, and arrangements had been made to open two or three hospitals as temporary schools in the expectation that the wounded from naval engagements might be brought to the area. There was also a report on local Red Cross work. 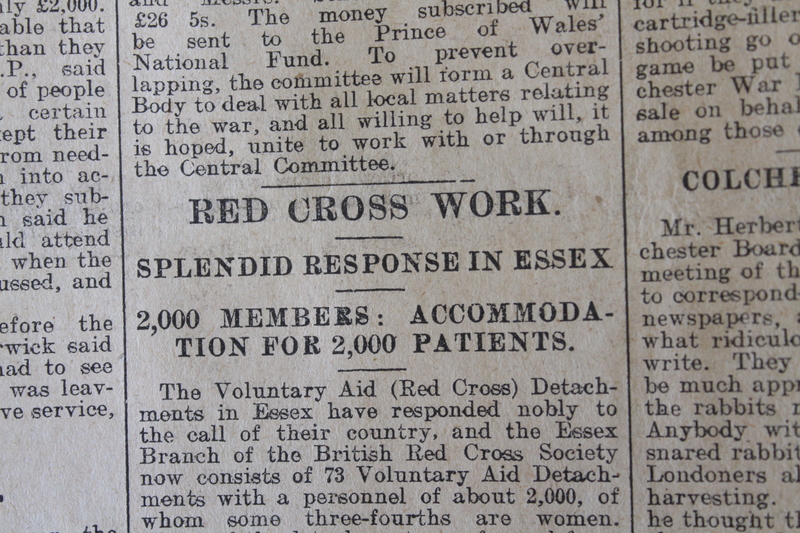 The Essex Branch of the British Red Cross was reported to consist of 73 Voluntary Aid Detachments, with a total personnel of about 2,000, three quarters of them women. These buildings included Easton Lodge, Dunmow, Hylands House, Widford, Birch Hall, Theydon Bois and Sewardstone Lodge, Waltham Abbey. 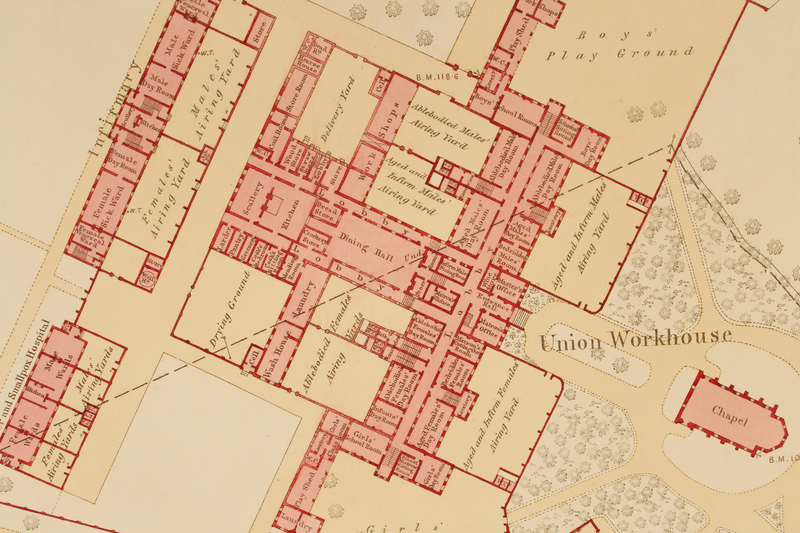 Many schools and other public buildings had also been identified as possible hospital sites. The Palace Hotel in Southend, for example, had already been set aside for use as a naval hospital, to be known as Queen Mary’s Royal Naval Hospital, with accommodation for at least 400 patients. There was to be much, much more published in local papers on the war and the impact it was having locally over the coming months and years, and they make fascinating reading. If you would like to see for yourself, the ERO has some local newspapers available on microfilm, or you can visit ERO or any Essex library to use the British Newspaper Archive online for free. 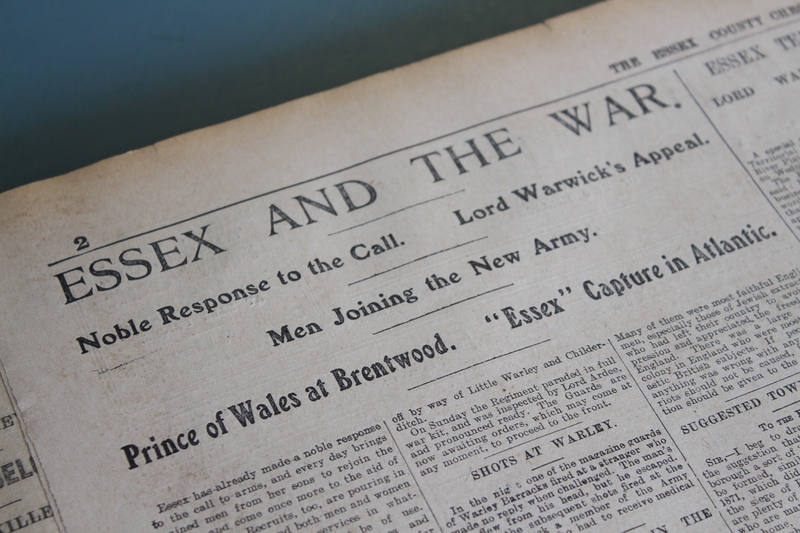 As we mark the 100th anniversary of Britain’s entry into the First World War on 4 August 1914, we thought we would take a look back at the immediate reactions and concerns of Essex people to the outbreak of the war as portrayed in the Essex County Chronicle. The first edition of the Chronicle to be published after the declaration of war was on 7 August. As well as giving us an insight into people’s thoughts on the war, the paper gives us an idea of the activities and occupations of people on the eve of the conflict. A Bank Holiday had just passed, on which the Great Eastern Railway had conveyed 42,411 people to stations serving Epping Forest, and there had been shows and sports around the county. Essex’s status as an agricultural county is also evident; it was reported that Chelmsford was confirmed to be home to the third largest wheat market in the country, and Colchester the sixth largest. All was not well in the world of agriculture though; a farm labourers’ strike in north Essex had culminated in five haystacks being set alight in Steeple Bumpstead and Birdbrook in the weekend before the declaration of war. 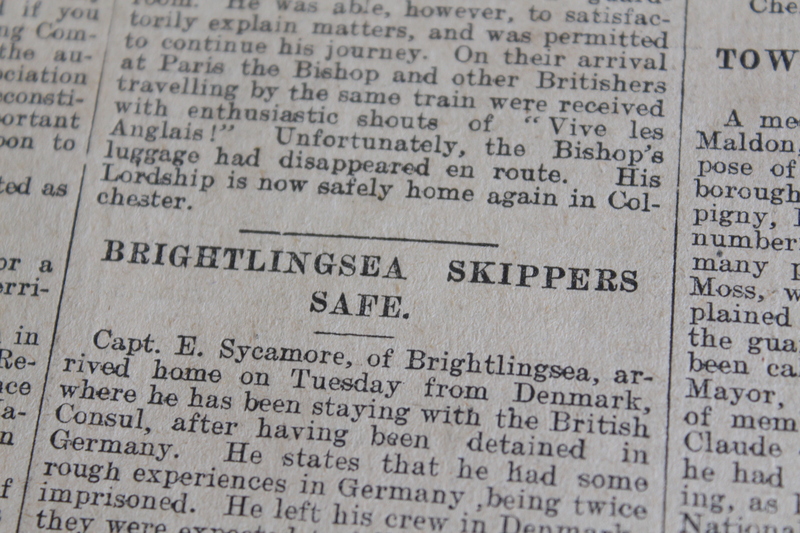 All of these snippets of news, however, were overshadowed by news of the war, and speculation as to how Essex was going to be affected. The paper explained briefly what had unfolded on the continent so far: the Archduke of Austria had been assassinated by ‘some mad youth said to be a member of one or other of the cut-throat Societies which abound in Servia’. The ensuing row between Austria and Serbia had escalated until Russia and Germany became involved, ‘and so the mad Dance of Death has begun’. The overall impression given by the paper’s reporting on the war is that people were not happy about it, but they would do their duty. 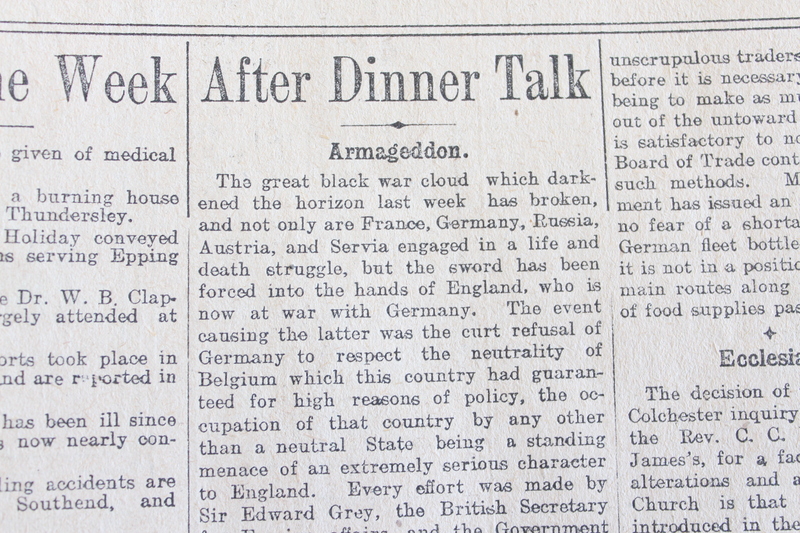 Under the heading ‘Armageddon’, one journalist described ‘the great black war cloud which [has] darkened the horizon’, and thought that everything had been done by Sir Edward Grey, the Foreign Secretary, to ‘avoid joining the titanic struggle’. Germany’s invasion of neutral Belgium, he believed, had left Britain no choice. This is maybe not a totally accurate description of the prevailing mood, as the paper also reports on fears of a German invasion and on people hoarding food. There was instantly some discussion in Essex about the possibility of a German invasion of England. 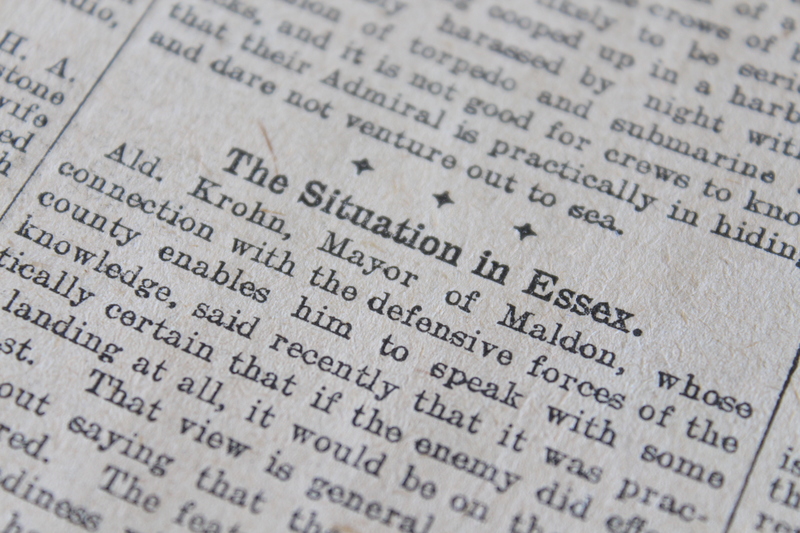 The Mayor of Maldon, Alderman Krohn, was reported as saying that ‘it was practically certain that if the enemy did effect a landing at all, it would be on the Essex coast. That view is general, and it goes without saying that the authorities are prepared’. The idea that the authorities were prepared for a German invasion in August 1914 is not borne out by other sources, but that’s for another blog post. Mr. J.J. Crowe, Chairman of Brentwood Urban Council, had commented that ‘Such wholesale buying of food and rushing to the bank … are not only unpatriotic but wicked’. 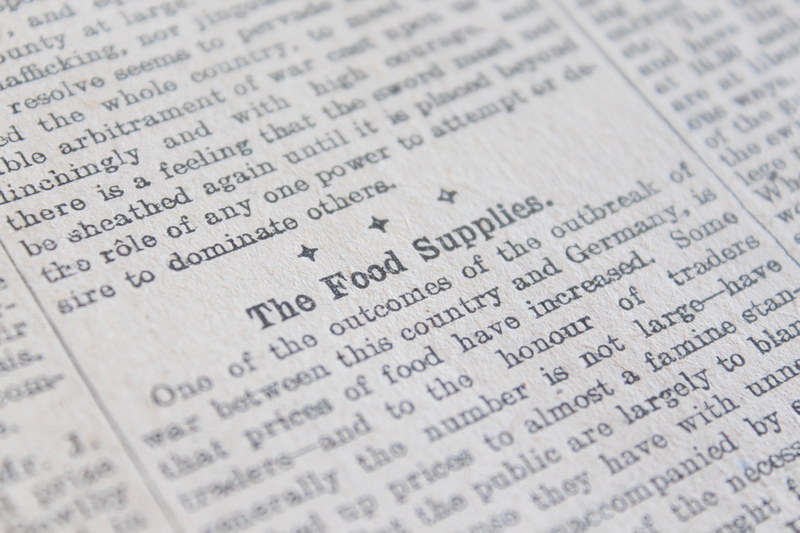 In the meantime, the Government had issued an assurance that there was no immediate danger of a food shortage; the German fleet was blockaded in the North Sea, and not in a position to interrupt the main routes through which British food supplies passed. Just as we look back to the past of 100 years ago, so did the people of 1914. 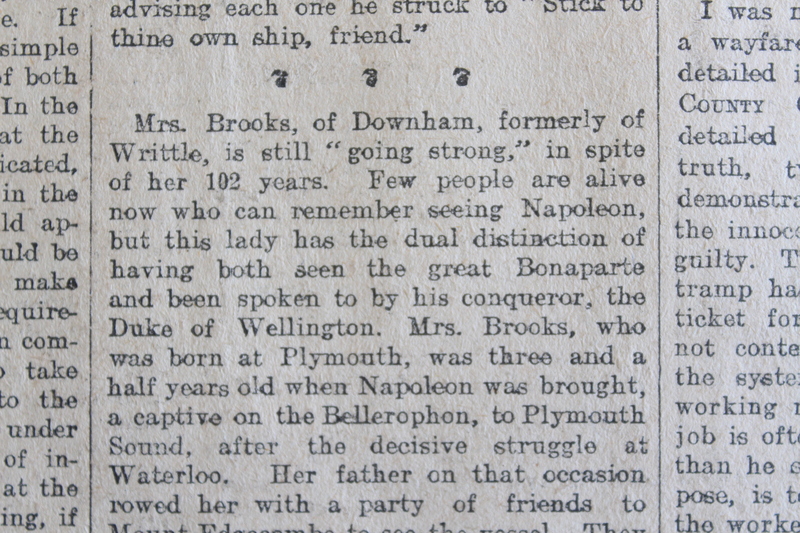 The Chronicle of 7 August included mention of a Mrs Brooks of Downham, apparently still going strong at the age of 102. Mrs Brooks was born in Plymouth, and as a 3 ½ year old was taken by her father to see Napoleon as a prisoner on board the Bellerophon before he was taken to St Helena. When she was 17, she briefly met Wellington while visiting the Hon. Mrs Cotton, daughter of Lord Combermere. 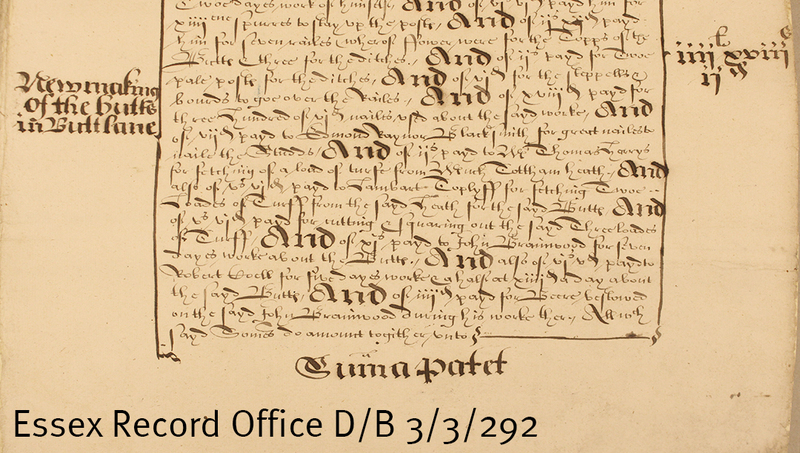 One of our searchers, Tom Johnson, recently spotted this passage in the court book for Maldon from 1457-1543 (D/B 3/1/2) and kindly forwarded us a transcription and a translation. 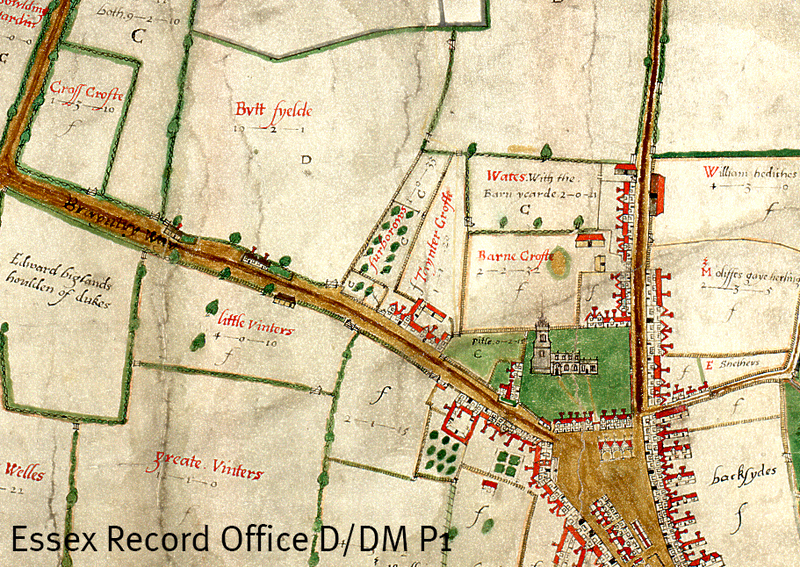 The passage lists a series of insults not allowed to be used against any of the Borough’s officials – the bailiff, his friends, the wardens, ‘or any other man inside the walls’. Anyone caught using any of these insults was liable to a fine of 6 shillings and 8 pence (this does of course leave open the question of any insults not included on the list). And it is computed in the first court of the year last past that from ancient custom it is not allowed to anyone coming within the borough aforesaid to say violently to any bailiff, or bailiff’s friends, or any other man inside the walls, or of the wardmen there living by any means[? ], the names or [lit.] endings following, that is to say, thief, nor whoreson, false, nor forsworn, cuckold, nor knave, backbiter, nor bawd [pimp], to their public reprobation neither in judicial fora, acts, cases (nor [even] traitors, unless to the use of the lord king, these [words] judicially licensed) under the pain of the court, to the use of the borough aforesaid, as often as it [the court] is held, being 6 shillings 8 pence [half a mark]. This is made at the beginning [of the court], firmly guarded.